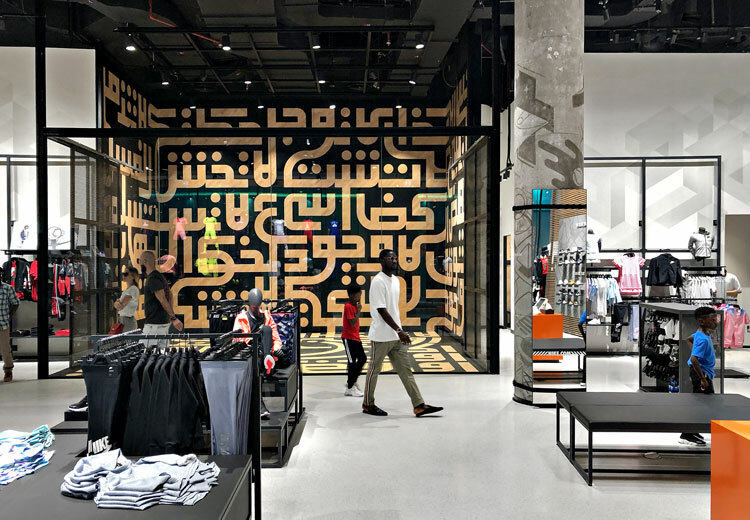 A new Nike store has launched at the Dubai Mall in Dubai, centred around the concept of using Arabic script to convey Nike’s brand motto throughout the store design. Mohamed Samir, who was a freelance designer when he completed the project and now works as a senior product designer for Apple, worked on the store concept with Nike’s in-house design team based at its European headquarters in Hilversum, the Netherlands. 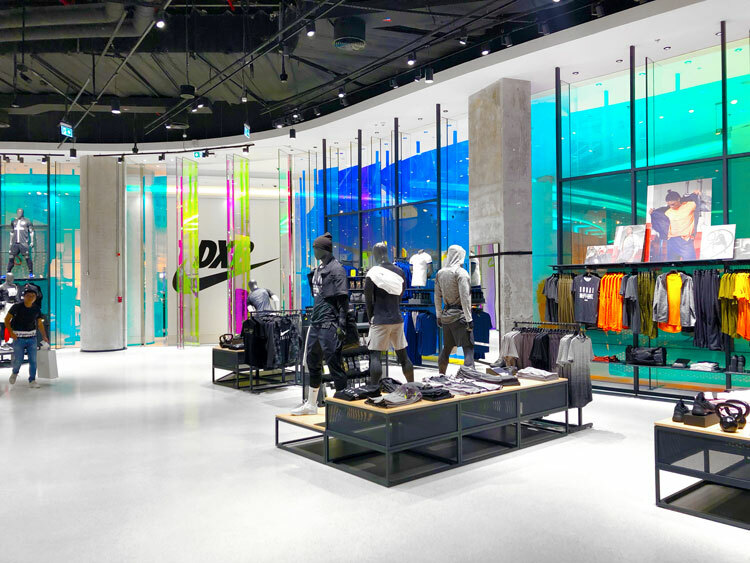 The look for the store, which is one of the largest Nike branches in the world, has been “inspired by the region’s culture while maintaining the modern sportive look of the brand,” Samir says. “The concept was to highlight the brand manifesto in different typographic styles across the store,” he adds. He has reinterpreted the Arabic script in multiple different illustrative and typographic ways, including bold block letters and a more calligraphic style. A key feature in the centre of the store is a basketball court-style “trial space”, where people can try out trainers and other products in a realistic setting. 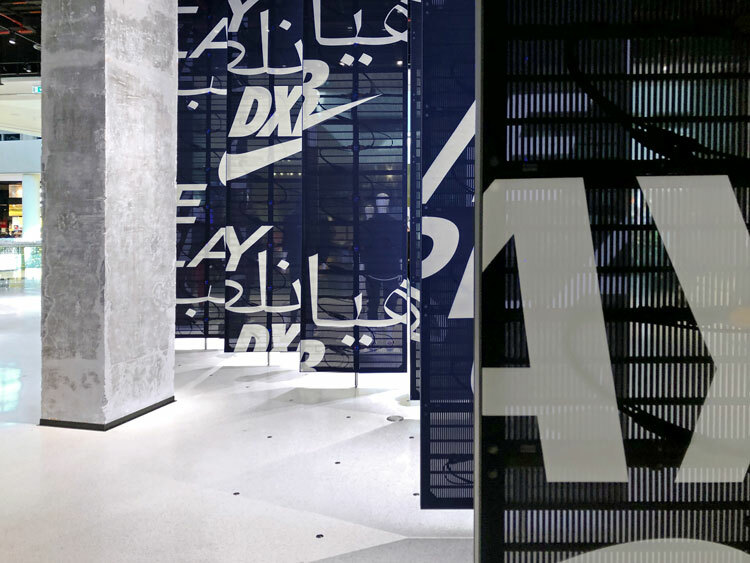 The wooden court is adorned with black markings similar to basketball court lines, which have been created using bespoke typefaces spelling out Nike’s brand manifesto in Arabic, Samir says. “The project shows the versatility that Arabic typography can offer through its flexible nature,” he adds. 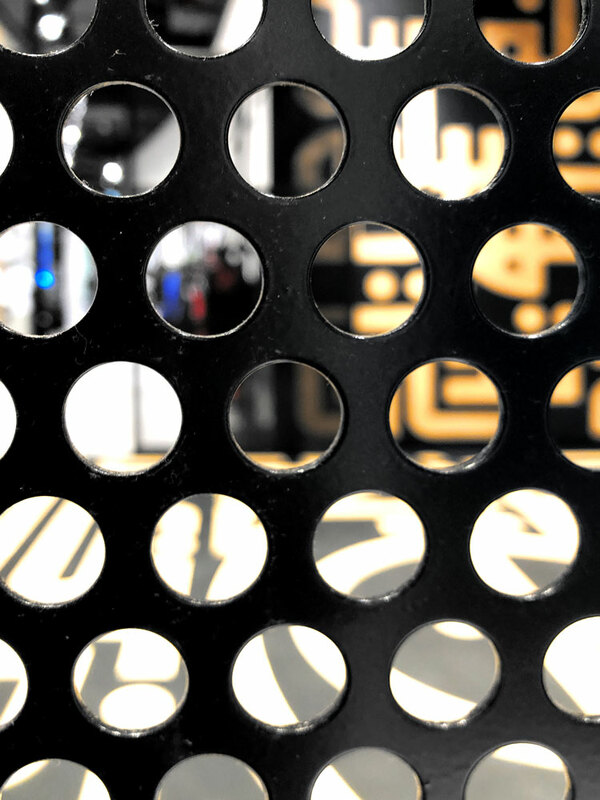 Black metal screens dotted with circular holes surround the trial space. Samir says the zone also aims to boost people’s enjoyment during their visit to the store, as it offers the chance to take part in an activity rather than just shop. 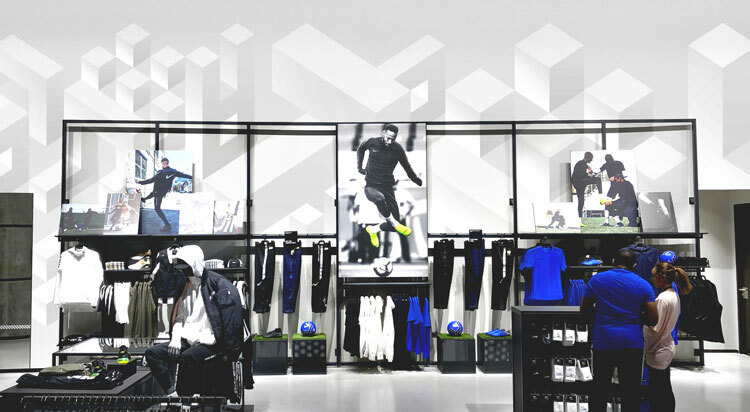 Nike has previously also installed a sports zone in one of its stores in New York. The interactive concept fits in with a current trend of retailers incorporating real-life settings into stores, to enhance the customer experience. 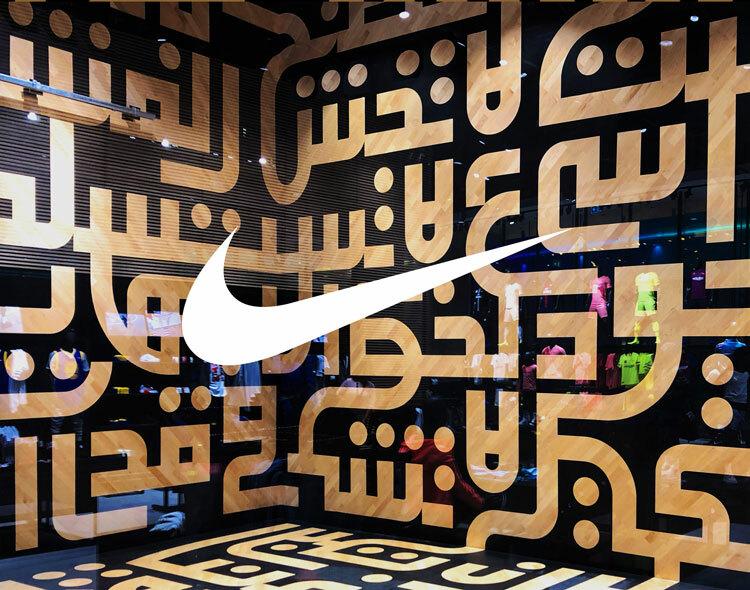 The brand’s tagline, “Just do it”, appears in Arabic, set in a geometric type in other parts of the Dubai store, such as on the walls. 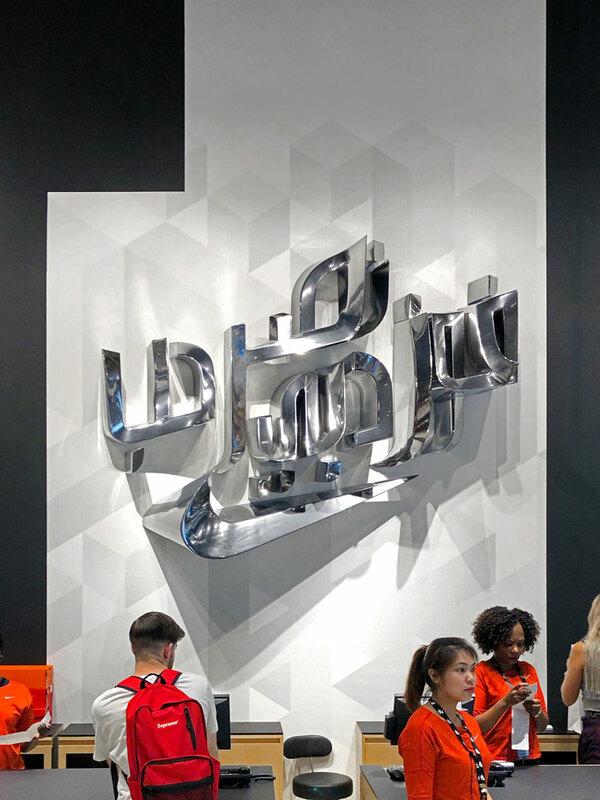 A silver, three-dimensional metallic sculpture also appears on one of the walls, featuring a Nike tick with Arabic writing above it which reads “win, victory, love — Dubai”. “[These words are] a famous hand gesture of Sheikh Mohammed, the ruler of Emirate Dubai,” Samir says. 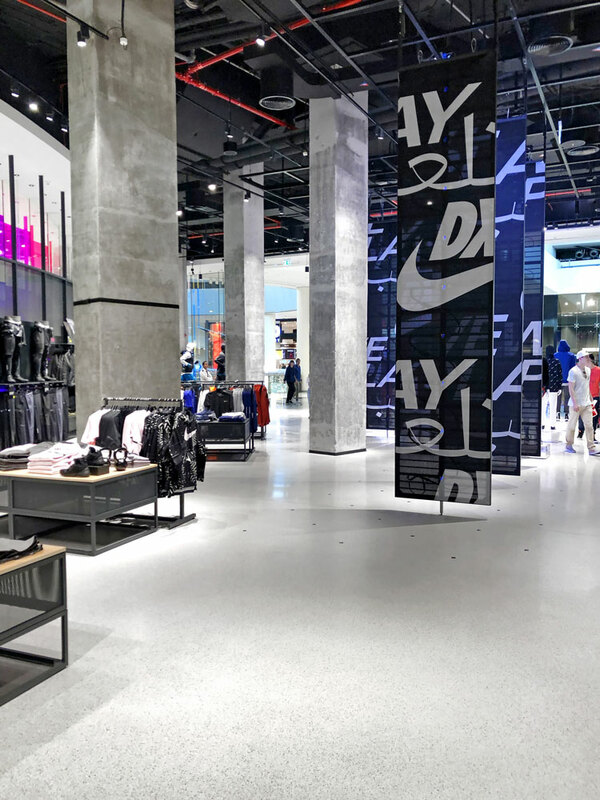 The colour palette throughout much of the store is monochrome, including white floors and mainly black fixtures, which Samir says has been chosen to “let colourful Nike products shine”. One of the main walls in the store has been treated with a light grey geometric “gradient type” pattern, which looks to holds all the different parts of the store together, according to the designer. Holographic glass tinted in various colours has been installed close to the entrance, and grey concrete floor-to-ceiling pillars appear throughout the store. The store launched in Dubai in December 2018.